How large you choose to make your project award is entirely up to you. Our flexible pricing is perfect for clients of any size. Keep in mind that each project category has a minimum award you must offer and which we make very clear. Also, remember that larger awards attract more (and higher quality) creatives. If your budget can stretch a little, consider offering a higher award. If you know you're looking for more than one design, plan to add a second (or third!) award to your project. You'll be offered this option when posting your project. In Explore, you can browse all projects on crowdspring to get a feel for the award amounts similar projects are offering. And of course, you can always reach out to our customer support team if you have any questions. You can also increase or add an award after your project is already open. In your Settings page, you'll find the "Change Awards" button on the right side of the screen. Click this button to add or adjust an award. To adjust your current award amount check the box next to "Adjust Award" and use the slider to adjust the amount. You'll see the total award amount reflected above the slider. Your total upgrade cost is listed on the bottom right corner in green. 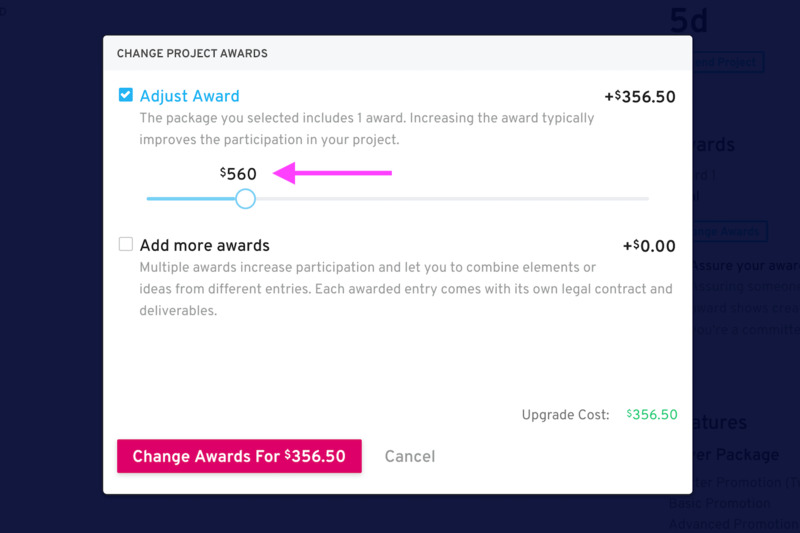 When you're happy with the total award amount, click the pink "Change Awards For" button on the bottom left to execute the change. Whatever payment method you used to post your project will be automatically charged to cover the cost. To add an additional award to your project click the box next to "Add more awards." Then enter your new award amount in the "Extra Award" field (the additional crowdspring fee is shown below). You can even add another award by clicking the blue plus sign button next to "Add Another." Your total upgrade cost is listed on the bottom right corner in green. When you're happy with the new award amount, click the pink "Change Awards For" button on the bottom left to execute the change. Whatever payment method you used to post your project will be automatically charged to cover the cost. If you have any further questions about project awards, feel free to reach out to our friendly customer support team!